We have scheduled this year's annual Paul King Memorial Skate-A-Thon for Saturday, Oct. 3 from 9 a.m. to 9 p.m. (flyer attached). We are moving along with plans to build the new concrete section in Paul's memory this fall. The estimate for the project is $86,000, and we have a little more than $60,000 in the bank right now (money we raised last year). So our goal is to raise $26,000. I realize that's a lofty goal and times are tough, but I never thought we'd raise $60,000 last year. So we're going to work hard to put on another great event this year and make Paul proud. 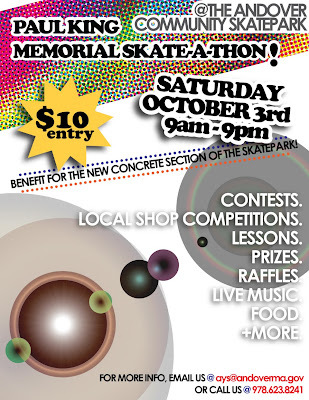 The skate-a-thon will include skateboard contests, food, a concert, and possibly a mini skate camp for beginners. Stay tuned for a full schedule.